Great artists are always challenging themselves, pushing the boundaries of what is possible and creating new pieces that require them to go to a place they’ve never been before. 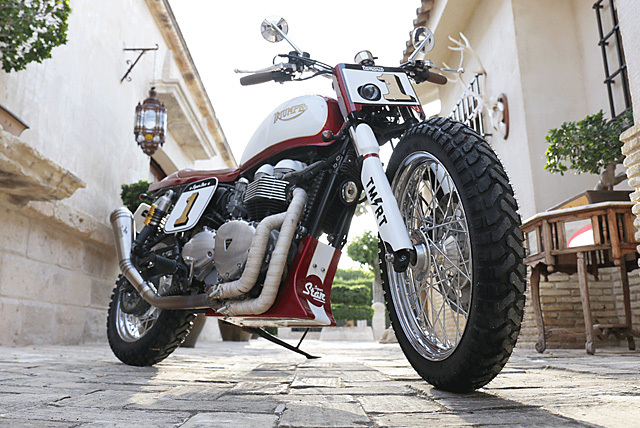 When you live in the incredible city of Elche, Spain, with its beautiful historic town centre, Baroque splendour and you spend your days churning out some of the best custom motorcycles in the country, it would be easy to rest on your laurels. But not the team at Tamarit Motorcycles. 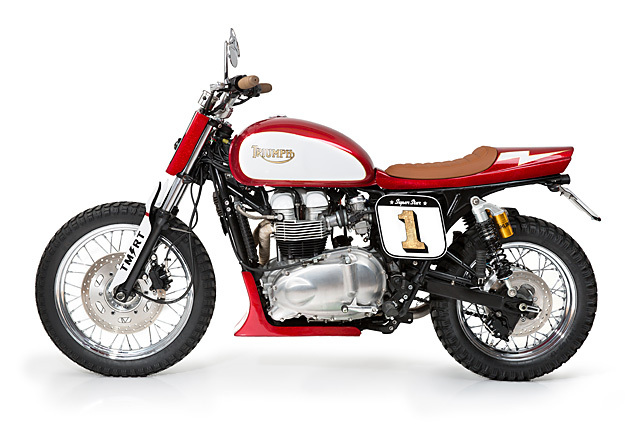 Specialists in turning modern Triumphs into cafe racers and scramblers for their backlog of clients, they decided to set themselves a challenge. Throw off the shackles of a customer’s requirements, liberate themselves from their previous styling and time constraints and see what would emerge. 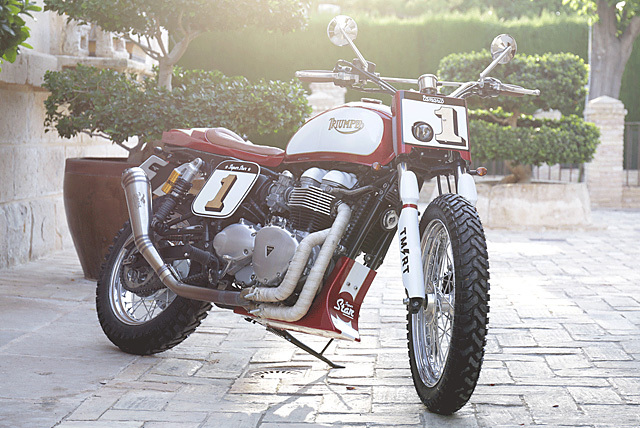 It all started with a simple Google search and the end result is this stunning Dirt Tracker for the streets, a 2010 Triumph Bonneville known as “Superstar”. 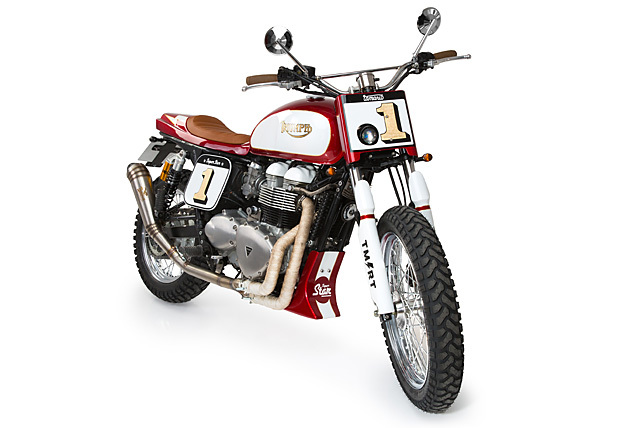 For Tamarit Motorcycles they found the vast bulk of their clients wanted either Cafe Racer or Scrambler transformations, both of which have been heavily entrenched in the European scene for decades. So with a desire to go in a new direction they opened up their web browser and punched “Dirt Track Racer” into Google. There they were in their hundreds, no headlights, fenderless, number plates and no front brake, all looking mad as hell; this was something they could get into. “That same concept we wanted to move to a street bike and following some legal regulations”, the rest of the design and fabrication would flow as the build took shape and their growing interest in Dirt Track racing evolved. As the foundation for their build they picked up a good condition 2010 Triumph Bonneville and started ripping off all the bits they didn’t need. Front and rear fenders were removed, along with the standard seat, the headlight and instrument cluster as well as the standard factory side covers. The bare canvas before them then allowed for a design to be drawn up with bold colours and authentic Dirt Track features. The rear end was the first to get attention and the goal was to shape a tail section that was both theme correct while still utilising an uncut frame. The fabricated fibreglass is simply a piece of perfection, providing the look of a rooster tail slinging beast while adding a touch of style. The seat pad was then shaped to fit the new fibreglass and once a slim profile had been achieved was wrapped in a tan coloured waterproofed leather for the right mix of form and function. 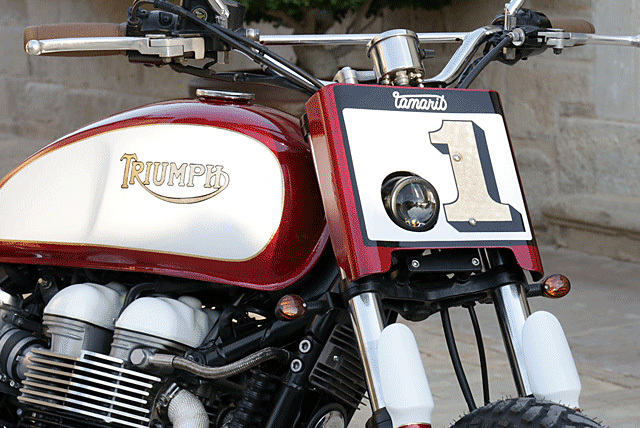 Of course any race bike worth its salt needs number plates and side panels and rather than simply buy pre-fabricated items Tamarit made their own to perfectly match the Triumph. The side panels cover the space left by the removal of the side covers and are finished in the classic ’70s shape. But it’s up front where they went the extra mile, rather than just creating a flat panel the fibreglass wraps around the upper fork stanchions to help keep them clean. But with the bike always meant for the street and not the track a small hole was cut out and a bright projector headlight mounted to poke through, that does the job without disturbing the lines. Protecting the lower half of the forks is a pair of custom-made guards that extend up past the seal covers and are shaped to also wrap around for a more symmetrical visual appearance. With that there was just one more piece of fabrication to go, a custom chin spoiler was crafted that extends all the way under the engine and to the front up to the bottom of the oil cooler to match the look of the alloy items normally fitted to a racer. But this bike was always intended to have a little extra flair and that comes in the form of the brilliant paint work. The red and white theme was one they had envisioned from the start, but to kick it up a gear the candy apple red contains more a big dash of metallic flake to shimmer in the sunlight and the pearl white gives an extra zing. To finish out the job the numbers are applied with gold flake and set off thanks to deep black shadowing. 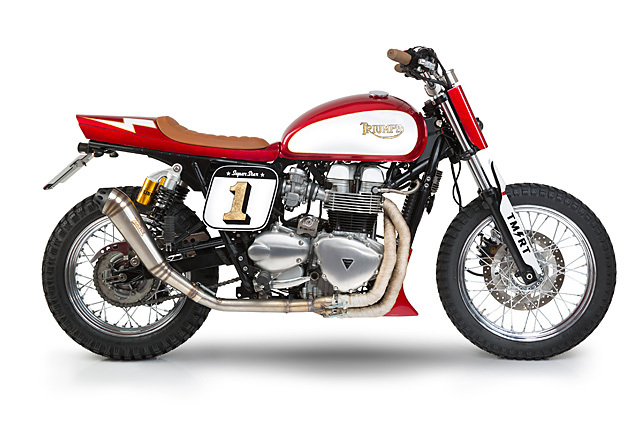 Powering the Tracker to victory is a fuel injected version of the famous 865cc parallel twin, DOHC, Triumph engine. Rather than leave it in the all black paint work it had come to them with, the engine was removed and given a total make over and refresh. The covers have been polished on both sides, with the same paint strip and polish being given to the cylinder heads. The valve covers were then removed and given a body work matching coat of white paint, while the cooling fins were flat filed and polished for a heavier raw metal feel. But it’s the custom exhaust system built-in house that gives Superstar the real Dirt Track look and sound the team was after. The twin pipes exit out of the right side snaking close to the engine for a compact fit, so they’ve been wrapped to keep the extra heat off the exhaust from soaking through to the engine. The twin pipes then merge under the brake pedal into a single stainless tract that leads back to the GP style single muffler that gives the sort of scream a race replica deserves. With Superstar a street ride, a low and hard suspension setup might sound good in the spec sheet but would be less than compliant on the back streets of Southern Spain. So the standard 41mm Kayaba telescopic forks remain up front but have been treated to new seals and oil. But out back the intention was always to raise the rear to give the seat a parallel line with the ground and if you are going to fit new shocks and the bank account allows for it there really is only one solution. The spongy factory units have been tossed aside and in their place are a set of fully adjustable Ohlins units measuring 36 centimetres and featuring remote reservoirs. The factory wheels remain in place but they’ve been re-laced with stainless spokes and while both ends wear Mitas E 07 Dakar rubber, a larger profile rear results in a beefy backend. Of course a Dirt Track racer would normally not have a front brake, but no matter how you try to justify it for the look it’s simply not safe for the street to remove it. With the bulk of the work complete the remainder of the build was about finishing off the details without detracting from the race look. Classic MotoX bars are fitted up to the stock risers and wear Biltwell grips in a seat matching tan. Replacing the gauge cluster is a single white face Koso speedometer so shifting at the right revs means paying special attention to the glorious sound emanating from the new exhaust. 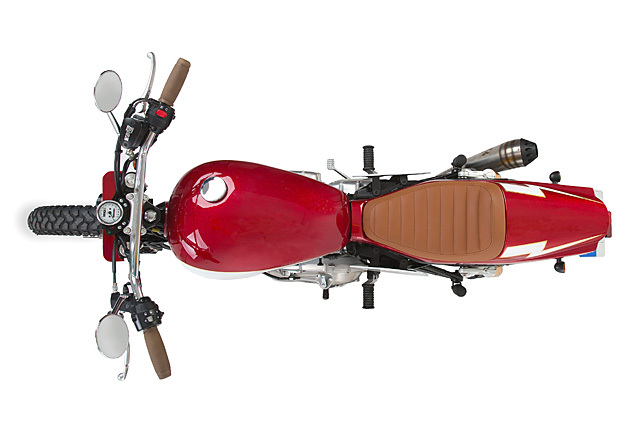 A complete array of turn signals has been fitted up that are far more minimalist than the standard items and small tail light sits where the new tail end finishes. With no rear fender the large European number plate was deliberately mounted and angled to act as a pseudo fender and with the legalities taken care of Superstar was set to hit the streets. Trundling along the quiet little roads right next to the Mediterranean sea it’s a bike that looks ready for the fight, but ultimately it was a freeing experience for the Tamarit Motorcycles team before getting back to the real work of building Cafe Racers and Scramblers. 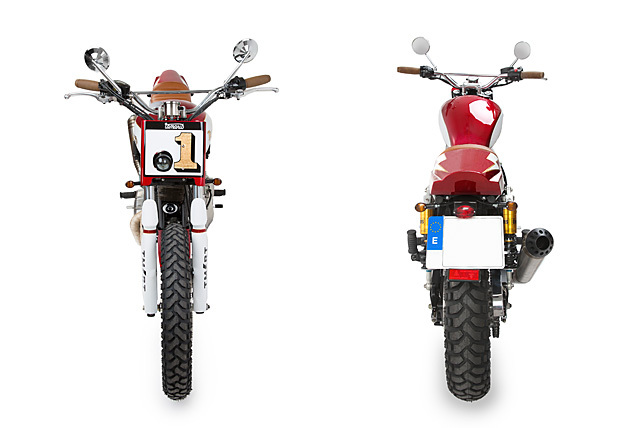 But with such a brilliant Dirt Tracker under their belt who knows exactly what the next customer will desire!